Building on the success of the first edition, UMTS Networks second edition allows readers to continue their journey through UMTS up to the latest 3GPP standardization phase, Release 5. 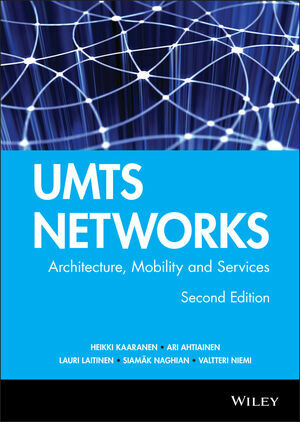 Containing revised, updated and brand new material, it provides a comprehensive view on the UMTS network architecture and its latest developments. Accompanied by numerous illustrations, the practical approach of the book benefits from the authors’ pioneering research and training in this field. Provides a broad yet detailed overview of the latest worldwide developments in UMTS technology. Includes brand new sections on the IP Multimedia Subsystem and High Speed Downlink Packet Access according to 3GPP Release 5 specifications. Contains heavily revised sections on the evolution from GSM to UMTS Multi-access, the UMTS Radio Access Network, the UMTS Core Network and services. Includes updated versions on services in the UMTS environment, security in the UMTS environment and UMTS protocols. Illustrates all points with cutting-edge practical examples gleaned from the authors’ research and training at the forefront of UMTS. The illustrative, hands-on approach will appeal to operators, equipment vendors, systems designers, developers and marketing professionals who require comprehensive, practical information on the latest developments in UMTS. This second edition will also benefit students and researchers in the field of mobile networking. Heikki Kaaranen, Cellular System Consultant, OY Aqua Records Ltd, Jokela, FINLAND. Ari Ahtiainen, Senior Research Manager, Nokia Research Center, Mobile Networks, Nokia Group, FINLAND. Lauri Laitinen, Senior Research Engineer, Nokia Research Center, Mobile Networks, Nokia Group, FINLAND. Siamäk Naghian, Competence Manager, NET IP Mobile Networks, Nokia Networks, Nokia Group, FINLAND. Valtteri Niemi, Nokia Research Center, Mobile Networks, Nokia Group, FINLAND.